Search the internet, and you'll find thousands of "real" ghost stories, haunted places all around the United States. And the Oklahoma City metropolitan area is no different. OKC has a few supposedly haunted places with unique stories and legends. And what better time to check them out than on ​Halloween in Oklahoma City. ​Several of these places are private property and cannot be visited without permission. 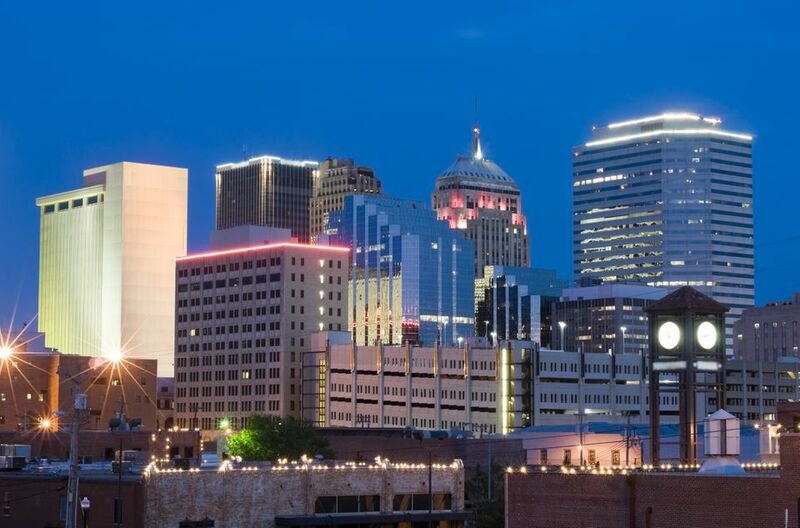 There is no more popular haunted place in Oklahoma City than the historic downtown Skirvin Hotel. A lot of people, including visiting NBA players, are convinced the ghosts of a young maid and her infant child frequent the establishment, particularly the 10th floor. Check the hotel out for yourself and get a detailed account of the Skirvin haunting story. At the intersection of SE 119th Street and Air Depot Boulevard, there remains a chimney and fireplace from an old house, long ago destroyed. The story goes that a witch lived there, and she will, from time to time, burn various items. There have been unverified reports that cars won't start and headlights go on and off a couple of miles away from Kitchen Lake Bridge near the remains. This is one of those rare hauntings without a story behind it. But apparently, over the years many people reportedly have claimed to have seen the spirit of a long-haired woman in the OKC Zoo Aquatics building. Located on SW 29th Street, Puckett's Body Shop has one of the more interesting ghost stories in Oklahoma City. In a video you can find on YouTube, images of a spirit were reportedly captured by a surveillance camera. The owners theorize it's the ghost of Tracy Martin, a woman killed in a car accident shortly before the surveillance camera tape was made. Martin's car was moved to the body shop by her insurance company only a few hours before the image was seen on tape. Halloween is spooky enough. How about getting a fright on...Labor Day? According to legend, the Student Union at Rose State College is haunted by the ghost of a security guard who hung himself. Visit on Labor Day at 12:01 a.m., and it's reported that you can hear the entire event. The owners of the Stone Lion Inn, 32 miles north of Oklahoma City in Guthrie, offer murder mystery dinners, and they are more than willing to capitalize on the legend. According to the story, a young girl named Augusta died in the house, and today, some reportedly claim to hear a child's footsteps or see toys mysteriously scattered around. It's not a surprise that a city with so much history would be the locale of several reportedly haunted places. Oklahoma's first capital claims another popular ghost story at the haunted orphanage where an evil headmistress allegedly killed many of the boys and buried them in the basement.